The tongue is a very important organ in traditional Chinese medicine (TCM). It is said to be an offshoot of the Heart, which is the emperor of the body. The Heart is responsible for speech and laughter, and if your Heart is healthy, you should be able to express yourself easily without becoming tongue-tied. Your tongue can also reflect the health of the other organs of your body, and it is an important diagnostic tool. When you go for an acupuncture or herbal consultation, your practitioner will usually carry out some tests including looking at your tongue. But what exactly are we looking for, and why? Read on to find the answers to all your tongue related questions, and learn how looking at your tongue could help you to improve your health. Why do you look at my tongue? In TCM, the tongue is a diagnostic tool. We use it to confirm your diagnosis after we have reviewed your medical history and symptoms. When TCM was first developing, thousands of years ago, there were no blood tests, EKGs, endoscopies or other medical tests that we use today. So doctors looked at the most superficial organ (the tongue) to show us how the other organs were functioning on the inside. Over the years, tongue diagnosis has been an invaluable tool in finding out what is wrong with our patients. This is why we still use this ancient method today, thousands of years after it was first invented. What are you looking at when you look at my tongue? When we look at your tongue, we are looking at some different things. The color, size and shape of your tongue, and whether there is any coating, moisture or dryness are all important clues as to how your different organs are functioning. Different areas of the tongue relate to different organs of the body. The very tip of the tongue represents the Heart, and the area just behind this relates to the Lungs. These organs are in what is known as the “upper jiao.” This is the chest area, and its functions include respiration and ventilation. The middle part of the tongue represents the digestive organs, the Stomach and Spleen (in the center of the tongue) and the Liver and Gallbladder on the sides. These organs are all within the “middle jiao” area, in the middle of the torso. 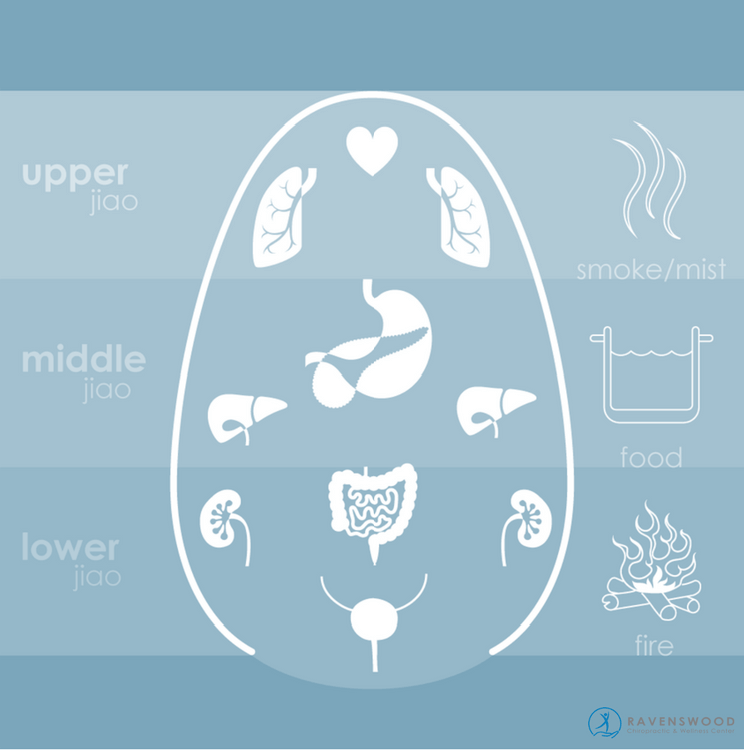 The middle jiao is seen as the cooking pot of the body, where many of our vital functions take place. The back of the tongue represents the Kidneys, Bladder, and Intestines which are housed in the “lower jiao”. This is the bottom area of the torso. As well as being responsible for excreting waste, the lower jiao, especially the Kidneys, provides warmth for the whole body. You can view the lower jiao as a fire, warming the cooking pot of the middle jiao, while the upper jiao acts as ventilation, allowing waste products to escape. 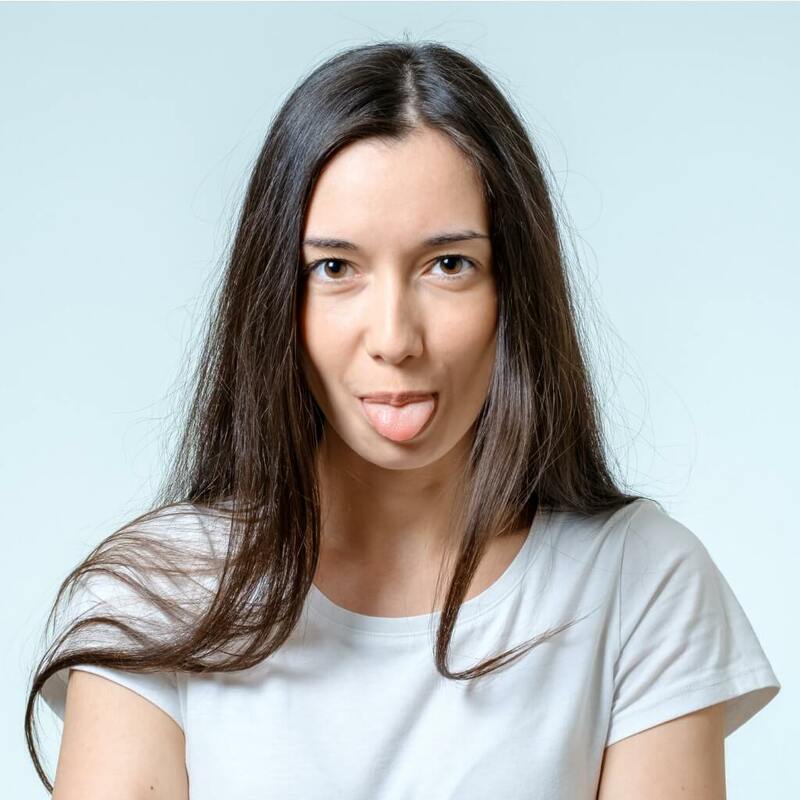 By looking at your tongue, we can determine how the three jiao is working about one another, and whether there are issues with any specific organs. Tongues can come in many colors including red, purple, pale, pink, or even orange. The color of your tongue tells us whether your body is too hot or too cold, how well blood is circulating and so on. If a particular part of the tongue is a different color from the rest, then we know that there is something going on with the organ represented by that area. Is there a coating on your tongue? What color is it? Is it peeled or cracked? What direction is it cracked in? Where is the coating? These questions can all give us clues as to what is going on in your body and whether there are any organs we need to pay special attention to. Tongue coating is especially important for showing us how well the digestive organs are working. A healthy tongue coating is thin, pale and “rooted” to the tongue, without any cracks or bald spots. If the coating is thick, sticky, colored, cracked or peeled, then this is a sign that some of your organs are unhappy and not functioning at their best. The shape of your tongue is also important. It should not be too thin, thick, short or long. Some people have flabby tongues with scalloped toothmarks on the edges. This is very common in our modern world and is a sign of too much rich or fatty food weakening the digestion. If your tongue is healthy, it should stay still and straight when you stick it out. If your tongue quivers, shakes or sticks out to one side, this could be a sign that something is wrong. The sublingual veins are the veins on the underside of your tongue. They should be even on the left and right sides. If one side is fuller than the other, or if the veins are pale, too thick or too thin, these all point us to a problem with the circulation. If you want to know what a healthy tongue looks like, imagine the tongue of a baby aged one to two years old. A healthy tongue should be pink to light red, have a thin, white, even coat, no toothmarks, no cracks, and no dark stains. It should be round and smooth with even, thin sublingual veins. Certain foods, drinks, medications, and smoking can all change the color of your tongue and its coating. If you have had blueberries, oranges, black tea, Pepto Bismol or other brightly colored foods or drinks before your appointment, please let your practitioner know. It is also important not to scrape your tongue or touch it when you brush your teeth on the morning of your appointment. This will ensure that the tongue picture that we see in your consultation is a true representation of how your body is working at that time. You can also keep an eye on your tongue between appointments and note any changes that you see happening over time. This will give you an indication that you are on the right track health-wise and that all of your organs are functioning at their peak. If you notice something unusual, then consult with your TCM practitioner for more information and advice.